Project I.G.I. : I'm Going In (released in Europe as simply Project I.G.I.) 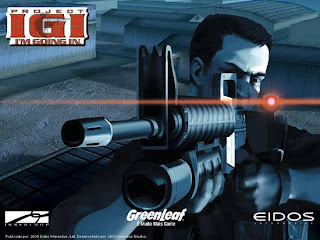 is a tactical first-person shooter developed by Innerloop Studios and released on December 15, 2000 by Eidos Interactive. It is one of the first computer game to feature realistic weaponry and tactical combat situations. Upon release the game garnered mixed reviews due to a number of shortcomings, such as poorly programmed A.I., lack of a mid-game save option, and the lack of multiplayer features. However it was praised for its superb sound design and graphics, thanks in part to its use of a proprietary game engine that was previously used in Innerloop's Joint Strike Fighter.